Binance is a significant presence in the cryptocurrency industry as the largest exchange by volume with $1 billion daily and nearly double the volume of the number two exchange OKEx. 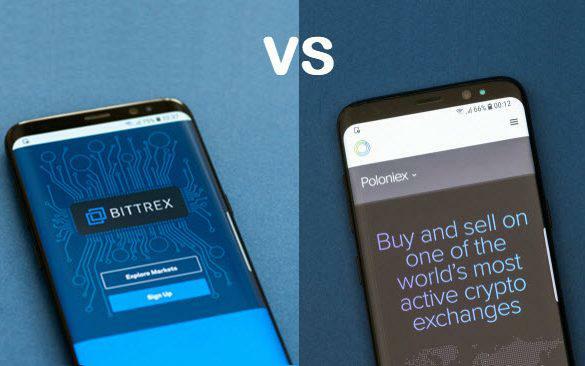 It enjoys a stellar reputation and raises the bar when it comes to security and service but does not incorporate fiat money services. A central hub for traders who want to expose their portfolio to a wider variety of coins, Binance was originally based in China but has since moved its headquarters to Malta to take advantage of the favorable regulatory environment. From there, the exchange serves millions of traders across the world, who love its fee-reducing coin BNB (Binance Coin), both for its utility and for a chance to invest in one of the biggest companies in the crypto space. First-time traders who want to become Binance members can go to the website and create a Tier 1 account without much trouble. After clicking Register on the top menu, you’ll be asked for your email address and to create a secure password. Binance’s version of a captcha is a pop-up that asks you to drag a small puzzle piece to the correct spot on the screen. Now that Binance knows you aren’t a robot, check your email for the verification confirmation message and click on the button. You’ll then be presented with a short list of security tips that Binance recommends for making your trading experience safer. It’s nice to see that they warn against common (and some uncommon) phishing attempts such as phone calls or requests for funds from those claiming to be Binance representatives. The exchange also highly recommends that all traders install 2-factor authentication to their phones. You’ll need to acknowledge these risks by checking the boxes before continuing to your Tier 1 account, which gives you a 2 BTC daily withdrawal limit. Before you do anything, install 2-Factor Authentication onto your smartphone or tablet. 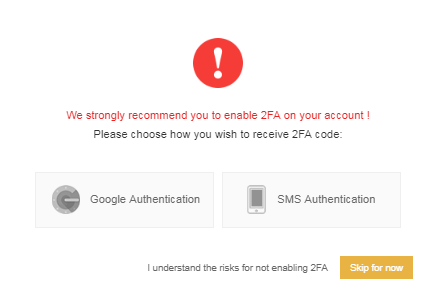 If you don’t want to use Google Authenticator, then you can also opt for SMS-based authentication messages, which provide an extra layer of protection on your account. Binance helpfully reminds you to do this every time that one logs in without it enabled. 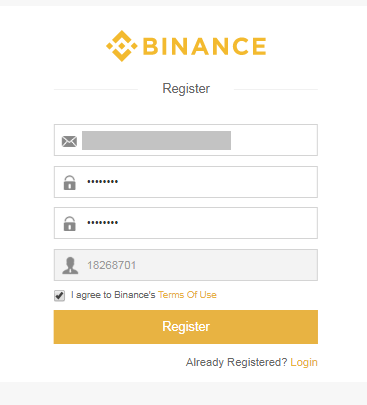 The Binance home page displays your account status, and also some various tools to use to enable security features like 2FA and your Anti-Phishing Code, change your password, manage your wallet addresses and more. From here, one can submit their identity documents and get them verified for Tier 2 account privileges, which include a 100BTC daily withdrawal limit. To deposit funds into your Binance wallet, you can click on the Funds tab on the top right side of the main page. A drop-down offers the choice between Balances, Deposits, Withdrawals, and Transaction History. Clicking on Balances reveals a page that lists each of your wallets, the total dollar value of their holdings, and a Withdraw and Deposit button for each. You can search on the top left for whatever coin you want. Clicking on Deposit next to your bitcoin wallet, for example, lets you transfer bitcoin to Binance from another bitcoin wallet. A pop-up will appear that generates a relevant deposit address, which you’ll then copy and paste into the withdrawal menu of whatever wallet you’re sending coins from. A QR code is also available if your wallet app has this functionality. After the blockchain verifies your transfer, it will be processed and automatically appear on your Balances page at the very top. Binance’s full list of cryptocurrencies can be purchased with bitcoin, Ethereum, Tether (a dollar-equivalent stablecoin), and their own Binance Coin (BNB). BNB is unique because using it to pay for one’s trading fees reduces those fees by 25%, and the company periodically burns circulating BNB to maintain its value. A trader can exchange their Ethereum for REQ and pay the fees with BNB, for instance. To do so, you can click on the handy Convert to BNB tool at the top of the Balances page. Once every 24 hours, Binance lets you automatically convert any listed coin into BNB. 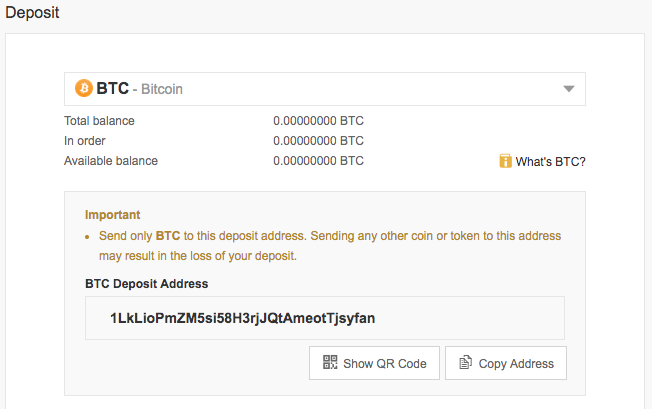 To trade with your newly deposited coins and BNB, click on Exchange at the top left side of any page. Both the Basic and Advanced versions of Binance’s exchange are similar, but Basic is recommended for most traders. You’ll see many windows, including the current coin’s chart and charting tools, the moving order book on the left, a search and multi-coin display window to the right, and Buy and Sell windows at the bottom above the fold. You can make a Limit order at a custom price or Market order to buy at current market price. If you hold BNB then your fees will automatically be paid in BNB—though this can be changed in your account settings. As a crypto-to-crypto exchange, Binance doesn’t suffer the same limitations that fiat-inclusive exchanges do, and therefore takes members from everywhere in the world. Binance customers are well represented in the United States, China, Japan, United Kingdom, Germany, Spain, France, Australia, Canada, and countless others. Resources like FAQs and support guides/forms are available in many languages including English, Chinese, Japanese, Korean, and more. Binance lists 386 cryptocurrency pairs, counting those coins that have multiple counter currencies across bitcoin, Ethereum, Tether, and BNB. While bitcoin has trading pairs with each counter currency, lower-volume or less mature cryptocurrencies will only be tradeable against ETH or BTC. Also, cryptocurrencies from projects built on Ethereum’s blockchain will usually only be tradeable against ETH. In terms of liquidity, no exchange can match Binance. With more than double the volume of the next highest-volume exchange, getting listed on Binance means instant liquidity for an aspirant tokenized blockchain project. Binance has some of the most competitive fees in the market, with average trading fees at 0.10%. You can reduce your trading fee by achieving a higher 30-day volume or holding more BNB. 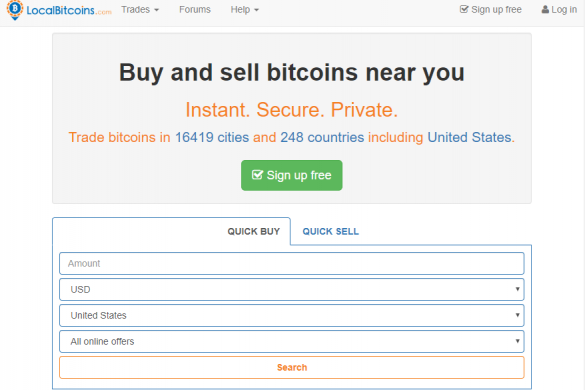 Traders with 150,000 in 30-day bitcoin trade volume or those who hold at least 11,000 BNB will pay fees of just 0.02%. Paying these fees in BNB reduces them by 25%. 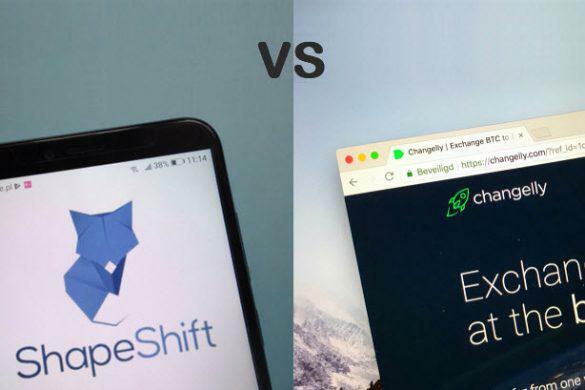 There are no fees on deposits of course—there being no fiat support from Binance—and the fee for withdrawal varies by coin, but it’s generally very small. There is no deposit limit on Binance, and one’s withdrawal limit depends on their verification status. Those who have gone through the full verification process, which includes photo, video, and government-issued ID verification can earn Tier 2 status and a 100 BTC daily withdrawal limit. Tier 1 accounts, which require just an email and password, are limited to 2 BTC daily withdrawal. As a crypto-to-crypto exchange, the only way to purchase the cryptocurrencies listed on Binance is to transfer crypto from another wallet and use it on Binance. If you don’t have any cryptocurrency, get verified with a fiat-enabled exchange such as Coinbase where you can buy bitcoin or Ethereum with a credit card, transfer it to Binance and then go from there. Using this method, you’ll have to endure the fiat purchase fees imposed by whichever exchange you choose. Though Binance is barely a year old, the exchange has a veteran reputation for its unblemished record and effortless handling of immense volume and membership. Hackers attempted to hack Binance just once and failed, not managing to walk away with anything nor affect trading functionality. 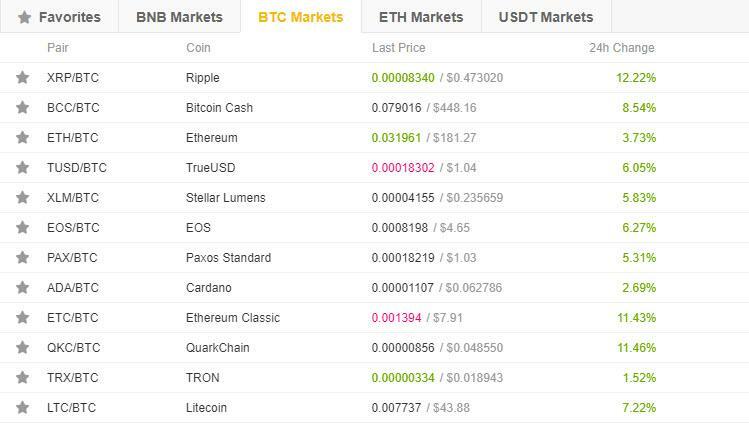 For trading crypto-to-crypto, there isn’t a better place in the world than Binance. 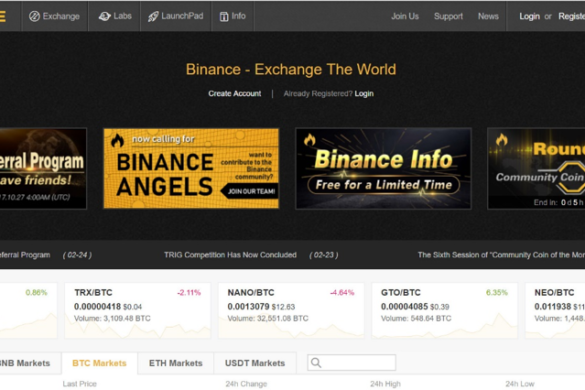 Its well-organized dashboard manages to make sense of a dizzying array of cryptocurrencies and trading options, and the Binance Coin model works well as both an investing option and to reduce one’s trading fees. Though it might take time for a uninitiated trader to learn the ropes, Binance does a great job at creating an accessible and lucrative platform for cryptocurrency trading.